At 6:41 it was officially underway. There was no gun shot to be heard (if there was one), but you could tell as everyone started moving nearly simultaneously. It is hard to describe the stampeding chorus of foot steps, but it seemed that everyone was jogging in cadence. We were moving pretty slow, but the beauty of the chip is it doesn't matter how far back you are from the starting line. Your race officially begins when you cross the red carpeting. I really wondered how that technology worked so well. I can understand a simple proximity device being registered, but there were over 2000 people running over this carpet in one to two minutes! The device off to the side was beeping like crazy and I thought it would be easy for it to miss a single contestant. It was great to finally be running! The first two miles were slightly downhill and I consciously tried not to pay attention to the pace of the other runners, focusing on the ground in front of me and telling myself to stay slow, don't go out too fast. The chorus of footsteps still filled the air. If you go out too fast I knew it could have ugly consequences later. But it was impossible not to follow the other runners being so crowded. A very funny sight was that of runners (male and female) veering off the road into the fields both left and right to find bushes and trees to relieve themselves. Yes, you can't be too bashful if you're a marathoner. I was feeling I had to go, but being my first marathon I thought I could tough it out: it'd relieve myself later in the privacy of one the port-a-potties at the mile markers if I absolutely had to. Somehow I did go out slowly. Nine minutes for the first mile and then 8:45 for the second. Very good for going downhill. In front of me there were a sea of people and the predominant color was white. I marveled at how fast some of these runners must be going. I wish I could say I was feeling great, but instead it was anxiety at how the run was going to play itself out. This may be the worse part of a marathon. On a scale of 1 to 10, I'd say I was feeling a solid 3. At three miles the course leveled as we made our first significant turn into a large housing development. We had two lanes of the roads all to ourselves. To our left at 50 foot intervals were red cones that would line the entire route and we were always to stay right of these. Even if there was a sidewalk present we were to run in the street. 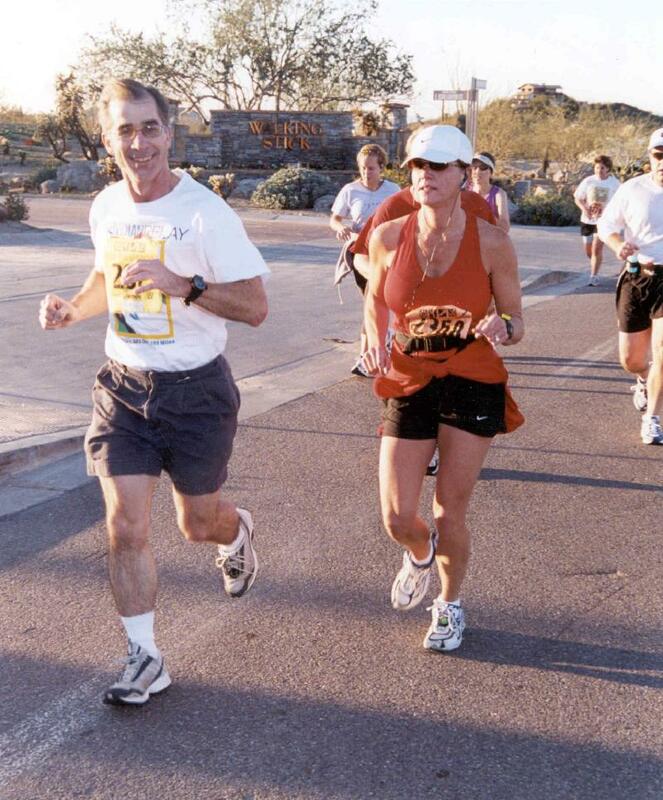 The mile markers in this marathon were two and half feet high sandwich boards donated by one of the sponsors, the Scottsdale Running Company. But along with the mile marker, most included a motivational saying. I can't honestly say I remember what even a single one actually said, but I did read them, especially at the beginning. Some seemed okay and others seemed a little corny. The thing was you couldn't help but read them. After all, what else was there to do to break things up. At 3 and half miles the course started up a grade that noticeably slowed many runners. Up until this point I had passed virtually no one, but now I was suddenly passing people left and right, even though I didn't think I was going any faster. My watch was telling me that I was keeping close to an 8:45 pace, just a little faster than my target, but it felt so sssllloooowwww I didn't think it could possibly hurt. But I wasn't at all happy with the way I was feeling. A recurring thought was how difficult this was going to be! I passed up the first water stop at two miles, but at the four mile mark I knew I better start hydrating. I grabbed a dixie cup of water from one of the outstretched arms of a volunteer at the water station. Being the first time I'd done this running, I was amazed to not have a difficult time drinking it. Slowly I was finally starting to have a good time and happy I'd decided to run in this marathon. I encountered the first batch of spectators yelling to us, "Way to go!" and "You're looking great!" Yeah, I am looking great! At about the four and half mile mark I could see Nicole and Julie in front of me as I was catching up. When I pulled up they said they'd slowed considerably when they hit the hill. The sun was now high enough that we were constantly in it's light and heat - it was already starting to feel warm. Ron went out very fast and I figured he'd be out of sight the entire race. I ran with Nicole and Julie for the next four miles and now it was really going great. It was genuine fun when I wasn't thinking of how far I still had to go. My target pace for the full marathon (4 hours) was their target pace for the half. At 6.2 miles we crossed the first of three checkpoints, a pad of red carpet with the sensors to register your chip, just like the starting line. It would record your time and the fact you'd made it that far! Soon after this checkpoint a banner moment came as we crossed the 6.5 mile point (which was not marked) signifying that one quarter of the run was complete! I was thinking it would be very nice to feel this way at the 18 mile marker! There were more cheers and claps, "You're looking great!" By mile 6 there were water stops every mile with an army of volunteers with water and/or Gatorade in a cup at arms length ready to hand to us. There were going to be many times during the race that I wished I could just stop and hug these people. They all seemed to be so happy and smiling while cheering us on. This was so different from my dashes down the Grand Canyon where any water you have is that you're carrying. With the heat I would not pass any of these stations. If I wasn't really thirsty, I would take the water and pour it over my head to cool myself as you could feel the additional heat as each mile passed. The water would really make be feel good for the next quarter mile. Approaching the nine mile mark, the marathon path would split and the half marathon group would head straight while we would make a right turn back onto McDowell Road. Nicole had told me that I better go ahead because she needed to slow down. I probably was going a bit fast at that point now feeling very good about completing one-third of the distance. If I felt like this at mile 18 I'm going to be very happy. As I neared the corner, there were now a lot of people lined up on the side of the road waving, clapping, and generally encouraging all of us. You heard over and over, "You're looking good!" It was okay. I felt good. It was easy to smile, wave back, and say, "Thank you!" Some of people lined up had signs. I remember one little kid having one that said, "Go Dad!" As I rounded the corner onto the dreaded McDowell Road I could hear someone saying, "Happy Birthday!" A young girl (she looked in her twenties) was soon along side of me saying, "It's not really my birthday. You're not going to tell them, are you?" We were at least 200 feet down the road already and I chuckled. "Sure! Like I'm going to run back there!" She agreed it was pretty warm, but she told her woe of training in the snow so she appreciated the weather. Her strong suit was actually biking and really was hoping to compete soon in a triathlon. I related my story of not being a runner and this being my very first marathon. In fact, I told her I hadn't run over 15 miles in my entire lifetime. We exchanged a couple of stories (when you're running this distance, you better be able to speak, otherwise you're definitely running too fast) about training. I briefly told of my canyon hikes and was able to point in the distance to Camelback Mountain which I've hiked 100 times. Squaw Peak (which I've hiked over 1200 times) was not visible being behind Camelback from our position. For anyone reading this who has not run long distances, you might be amazed that we're carrying on these conversations without gasping for breath. But it is vitally important that you never get out of breath in a long distance run. If you have to breath that hard you are simply running too fast and if you continue you will soon be walking. I was still reading the motivational sayings on the mile markers as everything seemed to be going well. At the 11 mile mark we turned north and would enter a 3 mile loop that would take us right back to where we were right then. Runners were coming out as we were going in and it was amazing to think these runners were 3 miles ahead of me! A quarter mile later I spotted Ron, but he was too far away and wearing headphones so he couldn't hear me yell. He was nearly 2.5 miles ahead of me! I was really feeling generally okay and I was hoping against all hope that maybe I'd feel this good at the 18 mile mark. But that feeling didn't last long. By mile 12 I could feel that I was indeed now tiring and the water stops were more welcome; it was now a question of how fast I would taper off. The thought that things were going to get very tough must be the worst part of a marathon. But a temporary moment of satisfaction came when crossing the red carpet which marked the 13.1 mile point - half way done. (Or for the pessimists, half way started!) My watch read 1:52 which was really good since only last October I'd done this same distance in 1:48. Only four minutes slower and this with a final goal of twice that distance. Before I exited this 3 mile loop, Megan announced that she couldn't keep up with me and had to slow down. In retrospect I should have slowed with her, but I was at a comfortable pace and didn't want to go any slower or any faster. Just keep the pace I was at I kept thinking to myself. As I exited now I looked at runners just entering the loop. Wow! Now I was 3 miles ahead of these runners. There were more people lining the street cheering us on with the same mantra, "You're looking good!" Really? Well I wished I felt a little better. As I now lost Megan, I was now keeping pace with another runner, Joe who I soon learned lived very near by. He was looking very strong and he told me this was his second marathon. He finished his first in just over four hours. I really wondered for a few moments if I had any possibility of that. Four hours was my secret wish at the beginning, but now my legs were starting to feel ever heavier and the heat was draining so in my heart I knew that time was probably out of the question. The real question was that of any marathon - are you going to finish? I was still feeling good about that, but now I really knew it would come at a high price. I passed the 15 mile mark without any fanfare in my mind, even though it marked the furthest I'd ever run in my life. Every mile after this would be uncharted territory. My parents had planned to see me running and I recommended the upcoming section of the course, but unfortunately they had completely closed this part of the course to all traffic. It was too bad because the next section I recommended was at the 22 mile mark. I was already worrying that I would be looking horrible at that point. I was even beginning to worry if I could make it that far. To continue on to Page 5, hit NEXT.